The beautiful Aberdeenshire River Dee opened its doors recently for the 2019 salmon fishing season. Already 15 perfect Spring salmon have been caught in the middle & lower river despite frozen river conditions so over all a good enough start to the new season. I remember a few years ago when a few thousand salmon didn't show up in the Dee on schedule which had a detrimental effect on the catches that particular year for most of the River Dee salmon beats. During the following fishing seasons many anglers didn't come even though the salmon were clearly back. This was a great example of the nonsense of Scottish 'catch stats' salmon fishing marketing and how it can drastically effect all rural economies during 'cyclical' salmon stock low points or when the river isn't in optimal water condition. 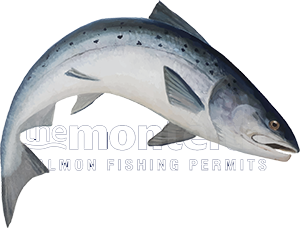 Neither low catch recording or low (or high) water means salmon are not present or cannot be caught and if you're waiting for perfection in this business you can wait a long time! Don't make the mistake of trying to treat a wild Atlantic salmon as some kind of time keeping expert as you'll be in for a rude awakening. Only a salmon decides when it's ready to come home and no one else and that plays a big part in the intrigue of this amazing pursuit. When the fishers 'spat the dummy' that year and bailed out there was minimal rod pressure to survey the River Dee's perfect salmon pools so the whole thing became a self fulfilling farce as to what salmon stocks were actually present during the following fishing seasons. As an example of the difference between a skilled salmon fisher and a fisher that just goes through their perception of the motions of salmon fishing one of the River Dee professionals I'm fortune to work with for guided River Dee salmon fishing days had over 120 salmon to his own rod last season and the season before! While River Dee salmon fisher numbers have not fully made it back following that salmon stock 'blip' this is a great example of the quality of sport this perfect Scottish salmon river still has to offer if you truly know how to approach and fish the Dee salmon pools. There are plenty of beats all over Scotland that would welcome 120 salmon as their entire annual catch! Personally I've fished many of the Scottish rivers and while I'm a River Tay man at heart the Dee is simply awesome from a salmon fly fishing & 'ease' of pool coverage point of view. The Cairngorm Mountain snow melt water supply and the perfect Deeside villages that are scattered up the Dee Valley take you into a completely different salmon fishing dimension. The professional River Dee ghillies are indeed 'top drawer' and some of the most dedicated and respected salmon men in Scotland are based on this amazing Scottish salmon river. There's plenty of perfect salmon beats up and down the Dee Valley but personally I love the Banchory area through the Spring & Summer months. The fantastic Invery & Tilquhillie salmon beat or the Banchory salmon beat under the professional watch of Karl Revel, Jim Turnbull & Brian Brogan are as good as you're going to get anywhere in Scottish salmon fishing. If you want a more diversified realm of River Dee brilliance in the hands of a fly tying legend there's also the adjoining classic fly water of the Lower Blackhall salmon beat under the expert eye of Head Ghillie Colin Simpson. Having these men advising you on how to fish their beats is the same as having Dalglish, Greig, Baxter & Johnstone in your football team! Banchory also has the lovely Banchory Lodge hotel which provides an excellent accommodation option. I also note that Invery & Tilquhillie and Lower Blackhall have already notched up 6 perfect Spring salmon between them over the first 9 fishing days of the 2019 River Dee salmon fishing season!